With Bring Your Own Device (BYOD) on the rise, many providers believe that texting is just another way to put an organization at risk for a data breach and associated fines. However, with the right solution and policies in place, providers can take advantage of this valuable communication tool and still be confident in preparing for a formal HIPAA risk assessment. 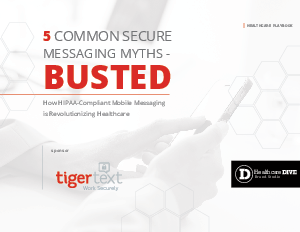 As you address how to properly secure mobile devices and comply with HIPAA regulations, we have compiled these 5 commonly held but mistaken perceptions of texting security and the actionable strategies to help you stay prepared and aware of existing secure texting trends and benefits.